Bilbo's my biggest collector... yet. ... and I've got priorities. But; I've brought treats. I had my camera handy while visiting Anurag Art and Bill, Zack and Terry let me take some of my early stuff off their walls (If we could reach it) and photograph 'em to share with y'all. I didn't manage to get down to the Whiz Bang (MPLS neighbourhood), but the next time I do, my crack(ed) team of private informers and I will try to track down some more missing, long-forgotten &/or hiding-in-plain-sight Broken Vulture Art-works. What a snide little look on this Mallard's face. What's with me and screwed-up clowns, anyway? Life, death and the highway. This big canvas is in a narrow area, so I couldn't get a straight-on shot. Very cool article about the oldest religious temple ever found... so far. How old? and where? The number given in the article is 10 000 BC . That's 12 ooo years ago, in what is now Turkey. When the polar sea ice is gone... Polar Bears will have to switch from seals to Inuit. Image by Eric; Broken Vulture Art. Thanx Will. NASA fears for the polar bears. Grizzly/Polar bear hybrid (with pic) reveals master plan of Polar Bears to move inland, consume people. Aboriginal offenders are more often placed in maximum security prisons and in segregation than non-aboriginal offenders, Sapers reported, and that "severely limits access to rehabilitative programming and services." He also said aboriginal inmates are not always given the same chance at parole as non-aboriginal offenders. Finally; a really cool looking First Nations comic; Rabbit and Bear Paws. My initial viewing gives me hope that this project has legs; it's good. Little Spirit Bear Productions is a First Nations (Anishinabe, Ojibwa) multi-media company that was created in 2005 by Chad Solomon, Grandson of a Native traditional healer and justice activist Art Solomon, to share the humorous adventures of Rabbit and Bear Paws. This fresh and funny comic strip for the young and young at heart is created and drawn with the guidance of his community elders in collaboration with writer Christopher Meyer. The first series of comic strips are based upon the teachings of The Seven Grandfathers (wisdom from the Anishinabek Community) and are rapidly gaining enthusiastic fans for their vibrant and entertaining images of Native traditions and oral history. In other comic newz; DC Comics Vertigo line is presenting a comic series that has Native characters in a mostly all-Native setting rather than "defined by their relation to white society. "(Quote from article). However: I really am not crazy for the title; "Scalped". Seriously; was this the best-fitting title they could come up with? The annual awards, worth $15,000 each, recognize outstanding mid-career artists in the seven disciplines funded by the Canada Council: music, theatre, dance, visual arts, media arts, writing and publishing and interdisciplinary arts. The Prizes were created using funds from a generous bequest made by the late Victor Martyn Lynch-Staunton to the Canada Council. Papier-mache giant; arm and shoulder. Papier-mache giant; paper added to hip. Papier-mache giant; with arms and shoulders mounted to check out look. Mr. and Mrs. Kidney (first draft). Click here to see pre-tweaking illustration, with orange background already added. Native Youth Magazine Out of Arizona. Chuck Pahlahniuk (writer of Fight Club) essay: 13 writing tips. Western Tobacco Prevention .Org page about the traditional use of tobacco. Links to other tobacco education topics/sites. Need a list to keep track of Wh1te H0use shenanigans down south? Wonkette has the list, for you, of: administration insiders, gophers, lobbyists, lackeys, powerbrokers and sleazy business friends that have gone down in flames. Quite stunning in its breadth, funny in its commentary. Some people in the states may not know, but Canada has an eleventh province, created from the Northwest Territories of the far north. It is mainly populated and run by First Nations people; Inuit and Indian.
" What is Nunatsiaq News? Nunatsiaq News is based in Iqaluit, a town of over 6,000 people at the end of Frobisher Bay on Baffin Island. " A stunning set of pencil portraits, of Native and Inuit elders by Manitoba artist, Gerald Kuehl. "I was fascinated by the stories of the individuals I met who had endured so much in their struggle to survive in the harsh northern environment. Those stories were often etched on the faces of these proud people through the lines and scars and even affected the expressions they wore. I was determined afterwards to capture that spirit and vitality through pencil portraiture." he CBC Literary Awards competition is the only literary competition that celebrates original, unpublished works, in Canada’s two official languages. There are three categories—short story, poetry, and creative nonfiction—and $60,000 of prize money courtesy of the Canada Council for the Arts. In addition, winning entries are published in Air Canada’s enRoute magazine and broadcast on CBC radio. " Invitation postcard for Will Lahti art exhibition, in Finland. Bitter Bitte Better Will Lahti, 1999; From the "sad fish" series. I was a bit perturbed to run into this story from the east coast. I had heard of the treaty/legal battles between First Nations fishermen and lobstermen and the fishermen/lobstermen of the 'greater society' that they are embedded in. The essence of the struggle is that shrinking resources and fishing quota regulations were already squeezing the commercial fishermen when treaty rights regarding fishing resources began to be recognised and enforced within the framework of existing quotas. Meaning: The newly recognised players in the commercial fishing industry -First Nations Communities- were being given a slice of the existing pie and shrinking the quotas for established fishermen, even further. Years after their entry into lobster-fishing, the Indian Brook First Nation is wondering what happened to the $5 million that were poured into a couple of businesses that were engineered by a portion of their council, cutting out the community and the elected Chief of the Band/(Tribe). Lobster article at Halifax Chronicle-Herald. Lobster article 2 - Commercial fishermen protest Native lobstermen. Lobster article 3 - Indian Brook gets last minute lobster licenses, without troubled business. I'm excited to announce that I've been offered a gig at the local Rainy River campus of Confederation College, to teach art. Much depends on the number of signups, but I'm planning a very 'practical, directed exploration' of building canvases and creating unique paintings. Fort Frances Times article. TPT (Twin Cities Public Television) Primer on powwows. Artellephant Puppetry and mask link. Eric Scweig was in a couple of my FAVE "Native" flicks: Skins and Last of the Mohicans. There has been increasing news coverage of the Caledonia/Six Nations standoff near Hamilton, Ontario; The Six Nations have manned a protest camp for months to block continued development of a housing project that was begun on land under land claim. An old land claim. The provincial government has since bought out the developers, but has not returned the land to Six Nations. A couple days ago there was a counter-protest "Peace Rally" by white locals and outsiders: supposedly protesting "differential treatment" of the Native protesters by the Ontario Provincial Police; claiming that white protesters would have long been arrested and cleared out. What I as a First Nations person hear, however, when I hear that we are being "treated differentially", is that we are not being murdered and overrun like in the "good, old days". I offer one link re: Caledonia, but ask yous to inform yourselves about this situation. The "good old days1" - Oka & "good old days 2" - Ipperwash. Some Seattle homeowners must be chagrined to find out that the "Green" homes that they were sold were actually built with wood harvested out from under the protests of the Grassy Narrows Community, near Kenora, Ontario. 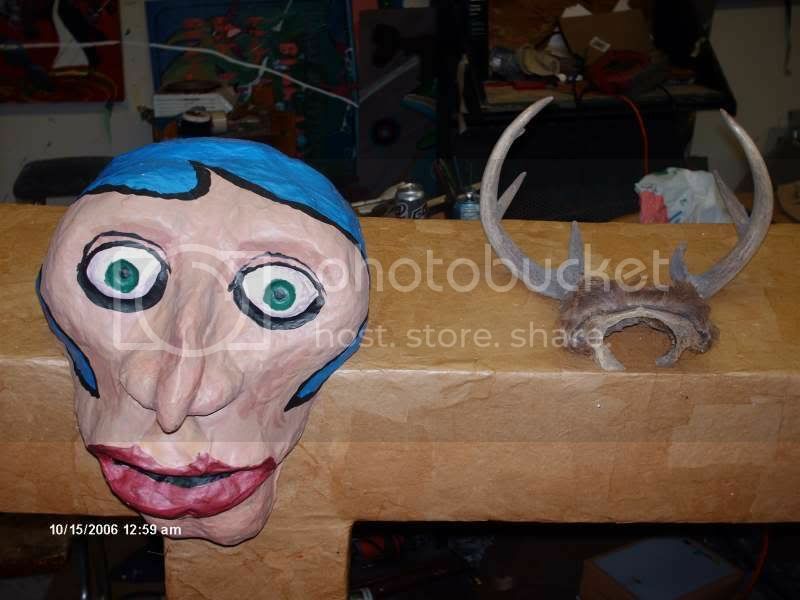 Download the report.PDF titled "American Dream / Native Nightmare"
Then add some more papier-mache and paint. My last day at the Farmer's Market for the season has come and gone. I am now surrounded by surplus inventory and bad thoughts of tweaking perfectly good jewelry and twisting finished sculpture. 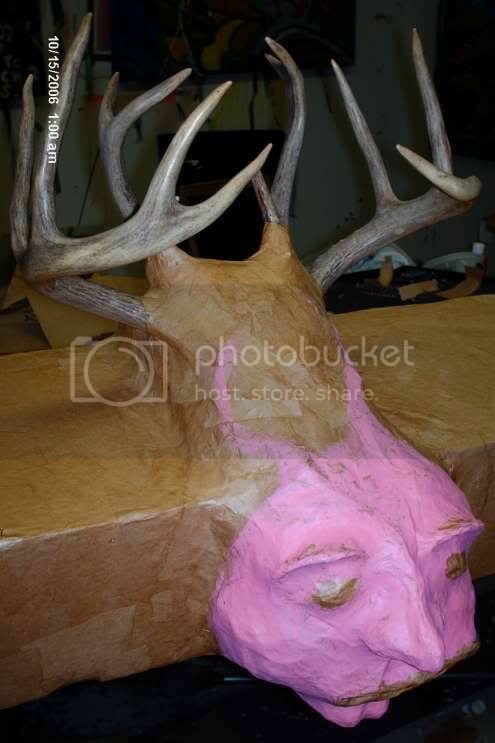 Helm-mask with matched antler set. Thunderbird; by Joe Becker. A pretty-rough carving, yet obviously Northwest Coast; demonstrating line and elemental forms. Loomwork beaded headband, with 'Thunderbird motif' and bonus teepees. The vast city - which is five miles long and two miles wide - is believed to predate the oldest known remains in the subcontinent by more than 5,000 years. The site was discovered by chance last year by oceanographers from India's National Institute of Ocean Technology conducting a survey of pollution. Pot sherds ("Late Woodland" fabric-impressed; 150-700'ish years old) and flint flakes (from stone-tool manufacture) collected from the surface of the Rainy River shoreline. Sacred-Texts .Com. Some of the texts that I looked at were published at the turn of the twentieth-century, but there may be older pieces. I can't help but think that the original version of the story was probably longer and more involved. The site also archives stories of other cultures and faiths from around the world. The First Perspective (National News) and The Drum (Manitoba & North West Ontarion News) are published together monthly by Taiga Communications Inc. at Brokenhead First Nation, Scanterbury, Manitoba. Taiga Communications is politically independent and is Aboriginal owned and operated. Our publications are indexed in the Canadian Periodical Index and they are available on-line at www.firstperspective.ca and www.manitobadrum.com. One of the many First Nation/Native American artists and poets that I had the honour to meet in Minneapolis was Jamison Mahto. I was fortunate to hear him perform his epic Blues For Franklin Avenue at a cafe in Northeast Mpls. - and I've hung onto this little book for the last ten+ years. I had heard of him and the poem, much before, however; people spoke of him in the way people speak of cherished characters who go deliberately missing; "He'll show up... eventually". Page 1(out of 5) - Blues For Franklin Avenue Click to read larger version; all pics click to enlarge. Xeroxed poster for Eric Keast's 1997 one-person show at the Hard Times Cafe (West Bank, Minneapolis, MN): Broken Vultures. Probably one of the earliest occurrences of the phrase "Broken Vulture"; the image is an early variation of one still used in the Bingorage backdrop(as of today and previous ten months, or so). Two Rivers Gallery poster for Eric Keast's 1997/1998(?) one-man show: Cable and Thong; Connections, at the Minneapolis American Indian Center. Very cool gallery space in a wee dodgy part of town, but we could draw some of the artsy folks from downtown and uptown. "The APC Music Awards is the only event where you, the fans, have the opportunity to choose which artist will be honoured in each category. Be a part of Canadian Aboriginal music history." Voting is enabled until midnight(23:59 pm, Central) October 13,06. Past the elementary and high schools, there are only occasional hints of something else. Samuel Eliot Morison, the Harvard historian, was the most distinguished writer on Columbus, the author of a multivolume biography, and was himself a sailor who retraced Columbus's route across the Atlantic. In his popular book Christopher Columbus, Mariner, written in 1954, he tells about the enslavement and the killing: "The cruel policy initiated by Columbus and pursued by his successors resulted in complete genocide..."
Millefiori-style fridge-magnet faces, in polymer clay. 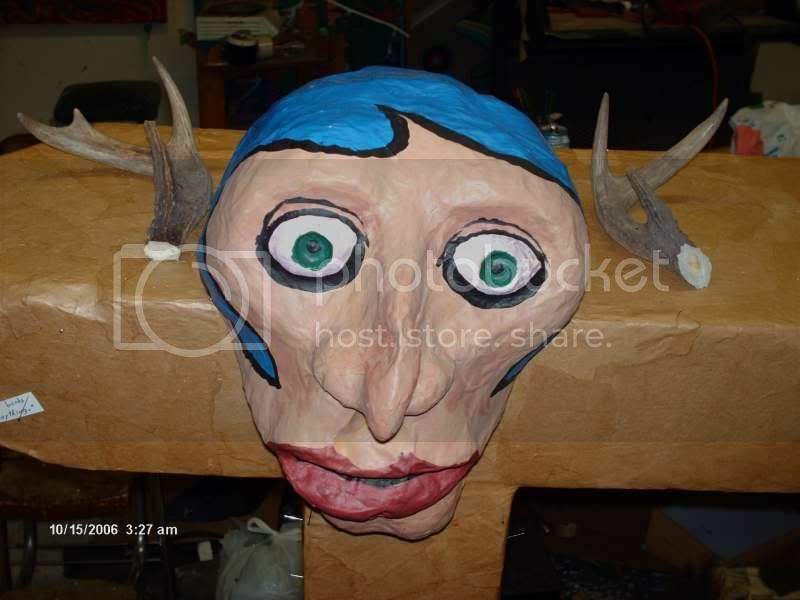 I discovered this puppet-maker's blog, reading through a papier-mache group newsletter. Some great works to look at, as well as tips and tricks for the crafter. Creaturiste. Matchbook cover: "H.K. Ranch and Trading Post" - "Membertou Sydney, N.S." These are the enigmatic words on the matchbook, below, that I found in my parents matchbook jar. It's not really a matchbook "collection", but the kind of archaeological deposit that any family accumulates. 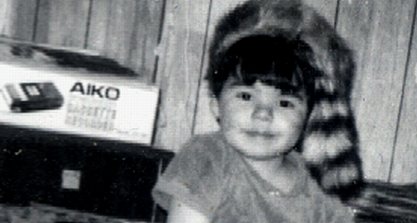 Click the matchbook cover for an enlarged detail of the photo. I had no idea what "Membertou" (not shown, words on foldover side) might be, but I suspected it was some kind of "Indian Village"-cheap tourist trap or screeching-kids' summer camp. Named after the Grand Chief Membertou (1510-1611) the Membertou First Nation belongs to the greater tribal group of the Mi'kmaw Nation. Membertou is situated in the city of Sydney, Nova Scotia, within its tribal district of Unamaki (Cape Breton). It is one of five Mi'kmaw communities in Cape Breton, and one of thirteen in the Province of Nova Scotia. Mi'kmaw infosheet at the Nova Scotia museum. Acoording to the Native-Languages.Org website, Mi'kmaw is an Algonkian-language, related to my ancestral Ojibway. I remember seeing a photograph of a Midewiwin birchbark scroll that illustrated the oral history of the Ojibway people; and it recalled a time when our ancestors migrated from the great water to the East. That movement probably began in prehistoric times and accelerated by European contact. Yeah, so what? I'm a mutant. Acrylic painting on paper. This was the first painting that I made, in my first studio space, in Minneapolis. It was a basement closet under "Second-Story Books" on Cedar Avenue. Second Story is gone, now (moved to Ely, MN) and the West Bank Neighbourhood is very different. I'll post a couple posters, soon, of some of my earliest art shows in MPLS. Galleries of petroglyphs (rock carvings) discovered on Ometepe Island, Nicaragua. Personal pages of M. Van Hoek, Dutch rock art researcher. With links to photos and descriptions of his rock art safaris... which led me to "Freemedia", free PDF downloads of rock-art related research and books. Not all, however, are in English. Pither's Point Park in autumn. Urban Shaman Gallery in Winnipeg (Manitoba) has opened its newest online project, Storm Spirits. The works for this project may be temporal and transient in nature, they may be interactive, inviting viewers to participate in an evolving construction, they may be permanent structures. We will present diverse and innovative projects that engage, define, challenge and investigate the use of digital and new media arts practice by Aboriginal artists. Exhibitions will change four times per year, with past exhibitions available in our archive. Essays by guest writers and curators will accompany each exhibition as well as video artist talks by the exhibited artists. We hope you will come back often. I am not entirely sure how this exhibit will progress, as it sounds like an interactive gig, inviting public prayer contributions and keyword analysis as a basis of change. Check it. Red-hot crucible pouring red-hot bronze. I am scanning and uploading pics for my friends at Anurag Art Bronze Studio and Foundry. Click the bronze to check out their pages. I had previously posted pics of this beaded bag -from my mum's collection- but I wanted to show yous... good scans of the piece; front and back. Another piece from her eclectic bead collection. A green and white netweave collar. Ran into this artist's designs while surfing myspace.com. Very cool hip-hop aesthetic and old-school posters. RezRocketDesign is a multi-disciplinary creative agency specializing in unique solutions for a variety of clients. At RezRocketDesign we practice strategic consulting, corporate identity, illustration, print design and mural painting. Bunky Echo Hawk has some great "pop-art" influnced works juxtaposing historical figures with contemporary settings and vice versa. Two quick faves: Sitting Bull being interviewed by Larry King and Yoda in powwow regalia. If you are looking into getting a digital camera or learning how to use one, better. There are some tutorials at Photon Head. Com. I'm sure that they can sell you one, too. There's some cool Inuit and Northern First Nations art being sold through this Viennese Gallery. Their online galleries have prints, sculpture, photographs and kitsch (Inuit-Art xmas ornaments, anyone?). Native Voices at the Autry was established in 1999 to provide a supportive and collaborative setting for Native American playwrights and actors from all over the U.S. and Canada to both develop their work and see it fully realized. Since 2000, Native Voices has held 35 workshops and presented 28 staged readings for Native artists. Also: Cool little gallery about Native Armament. The Native American Rights Fund invites Native American artists, ages 18-35 years of age, to submit works that focus, celebrate and highlight the 36-year old mission of NARF to defend and exert the rights of Native peoples and that focus on the modern day battles and issues of importance to Native Native Americans and the generations to come that include: sovereignty, cultural and spiritual lifeways, tribal lands and natural resources; Indigenous rights; education; and social justice. Krustayn Versus Mecha Sasquatch Copper Moose mask evolution details; Broken Vulture Art, Bingorage studio. Juggler painting, detail; Bingorage studio, Fort Frances.